Renew Crew 2017 – NECA's trip to Roatan! Thursday we visited a hydroponic farm in a well-kept arboretum. It started with a brick of nutrients, the seeds are planted into their own cubes which are placed on a slightly slanted table. Water is released at the top and trickles down. They have 7 different types of lettuce which they sell commercially at local grocery stores. To keep the lettuce alive they must feed it enough water with the right concentration of minerals. To assure this, they test the water twice a day and have to increase or decrease water supply based on the daily temperature. They also grow a lot of plants are native and non-native to the area, so they can figure out how to grow more plants to make a business and better the job selection in Roatan. They had vanilla beans, lime trees, miniature pineapples, cacao trees, coffee bushes, orchids, and more. The arboretum has added a lot to the community by adding jobs and hiking and biking trails to their property. Half of the students went around town to see perspective sites for solar projects in the future. We visited the local school, church, and water wells to see the shading and tilt of the roof tops. After we left, it was a free day at the resort to enjoy the sun and the warm Caribbean water. It rained so the group stuck together and played cards for the day until dinner. For dinner we all had a whole fish and ate the eyes so we didn’t get bad luck! Eddie from Vegas Electric, who volunteered his time this week to help us enormously with installing the solar panels, joined us for dinner. We had a nice meal and all thanked him. He came with a nice story fro. Raul, the pump manager, who read the meter for the first day of full power generation… 99 kWh in one day!! RECO (Roatan Electrical Company) only provided them with 50 kWh when they did recieve electric. 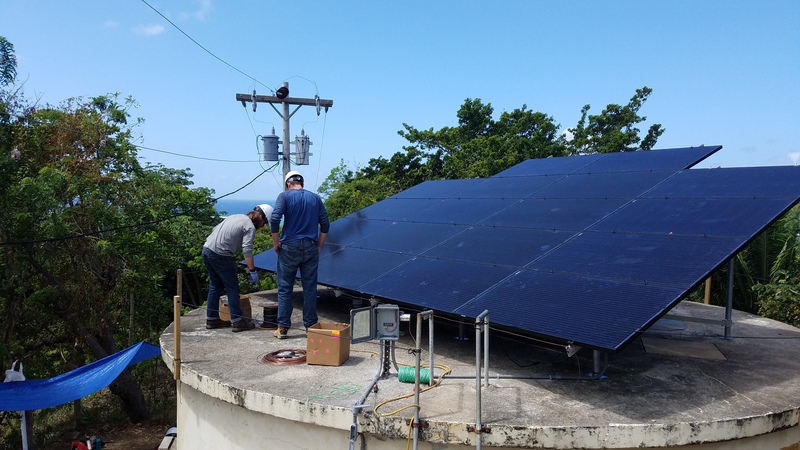 Knowing we can provide the community with more power that they had before all powered by the sun is very special. We are all humbled by this experience working with a community that only received water for 3 days a week to providing them with power to pump water everyday. Water is the essence of life and we are so happy to be able to provide that. Thank you very much to our sponsors and to Penn-Del-Jesery and Western PA NECA Chapters for supporting the student chapter and giving us the opportunity to do good for a well deserving community. 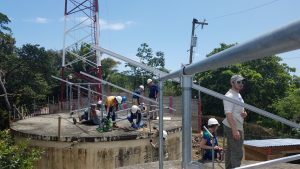 Wednesday was our last day in Punta Gorda, meaning… we finished installing the array! All 36 panels plugged in series, connected to a junction box, running through pipe to the inverter. We are all proud of our work and very happy to have the opportunity to learn the installotion process and help a deserving community. 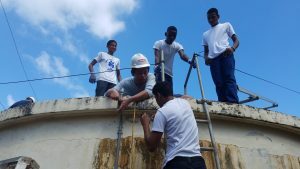 In the morning, students from the local school for electricians helped us do the last parts of installation. They gave us a break and a chance to teach other students about the process. They connected the panels in series, screwed braces into place, cut end caps, and leveled the final racking adjustments. Back at the cultural center we watched the traditional dances, one of which being the punta dance. Some of us tried out our dancing skills but could not compete with the locals. We finished our last night in Honduras with a community celebration! We danced to loud music on the beach, handed out flyers about the project, set up a model of the cistern and pump with a solar array, and rewarded the engaged community members with Penn State NECA shirts, which all the students were wearing to match. The community of Punta Gorda thanked God for the solar arrays and the efforts of Vegas Electric, Peacework, and Penn State. Today we installed the racking system which we mostly put together and labelled yesterday in prefab at Vegas. The group worked quickly and had the racks together and levelled before lunch. Taylor and Rachel visited the school to meet with teachers. They want more information on solar to extend their solar power curriculum in technology class. The first half of the day, they teach younger kids and the second half I’d dedicated to the older kids, so they only go ton school for half a day up to 9th grade. The kids were very quick to learn how the solar panel worked and blocked our miniature panel with their hand to watch the light bulb dim with less light. They are very eager to learn! After lunch, we oriented the racking south and leveled all the piping. Then holes were drilling into the cement atop the cistern and the racks were epoxied down. Finally, the solar panels were delivered from customs, so we all carried them up to the work site. Tomorrow we attach and wire the panels together!! It’s Sunday! Our first full day on the gorgeous island of Roatan, Honduras! This morning we woke up and had a breakfast of eggs, beans, and corn tortillas. We drove to Vegas Electric to meet Eddy, the amazing man that has helped us install our arrays every year throughout the island. Vegas Electric is Roatan’s renewable energy supplier and installer! We got a lesson on safety, then we were off to work assembling the racking. All the nuts and bolts were screwed into place, all the beams were cut to size and (mostly) all the holes were drilled! It was a long, hot, sunny day of figuring out which parts go where. Asking ourselves if it would fit and working as a group to make it work! By the end of the day, the base of the racking was all screwed together in hopes that it will be easier tomorrow! After work, we swam in the Caribbean and enjoyed the warm, clear blue water. We then ate dinner on the beach in West End, watching the sunset. Afterwards, the marine reserve gave us a talk about how they preserve the corral reefs around the island. Fun fact: they have a celebration of killing lionfish because they are an invasive species. Tomorrow we leave at 6AM; check in to see if we installed the whole solar array! We will be there in less than a week! Welcome to the Renew Crew 2017 blog! 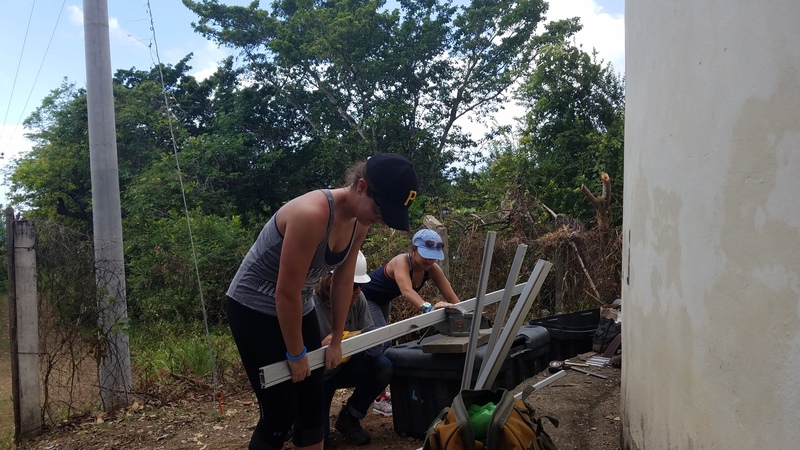 We will be posting updates and pictures of our work in the community of Punta Gorda, Roatan, Honduras! March 4th, Saturday: Drive from State College to BWI, fly from Baltimore to Houston to Roatan! We will arrive in Roatan at 1:30 PM and check in at our hotel on the West End. March 5th, Sunday: We go to the Vegas Electric prefab shop to prepare our materials to install the system. March 9th, Thursday: Hold a community meeting to answer questions about the system and celebrate our hard work!! We will also be visiting previous installing sites and possible sites for coming years. March 10th, Friday: Snorkeling tour in the coral reefs! !